I just got back from a trip to Alaska. What I didn’t know about Alaska: It is all mountains, all spruce trees, full of light, and prodigiously filled with cappuccino machines. My kind of place. I was hoping to get up close and personal with animals on the trip. In Dallas, I have close encounters with the squirrels in my backyard and regularly tangle with my cats. I also get to see animals behind bars at the zoo regularly. But I was hoping to see animals in the wild. There’s a great video clip of the teeming seas off the southern coast of Alaska in The Blue Planet, with breaching whales, vast schools of herring, flocks of seagulls, marauding orcas. I was also hoping to have some deep thoughts. Without an underwater camera and the wise voice of David Attenborough, the profusion of life isn’t quite the same, but on our 6-hour tour of Resurrection Bay, the gulf of Alaska, and Holgate glacier, we saw many humpback whales, many orcas, a ton of stellar sea lions, one black bear, a few bald eagles, lots of dall porpoises, some goats, and a lot of puffins. Deeper thoughts were stimulated by reading The Whale and the Supercomputer before the trip (by Charles Wohlforth). This is a book about all the signs of global warming in Alaska, but there’s a book within the book (and maybe it should have been separate) about Eskimos and whale hunting. The Eskimos have a centuries-old tradition of hunting whales in the Arctic sea. At the Museum of the North in Fairbanks and the Museum of Art and History in Anchorage there are wonderful exhibits that illuminate just how central whale hunting is to the Eskimo way of life. (There are actually many Eskimo cultures, and the one Wohlforth focuses on is the Innupiat). The Innupiat hunt bowhead whales, not the humpbacks and orcas I saw in the Gulf of Alaska. The connection to the global warming issue is that it’s getting harder to hunt whales because there’s less shorefast ice extending out into the sea that can be used to get out into a position to watch for migrating whales, and launch the hunt. Wohlforth sees the threat to whale hunting as one of the tragic consequences of global warming. But from a whale’s point of view, it’s not tragic at all. Seeing whales first hand on the glacier cruise, I was baffled how it is even possible for anyone to kill a whale. What is it about a breaching whale that so totally delights us? The leap into the air seems so free-spirited. It bespeaks sheer, boundless fun. How does a person drive a harpoon into the head of such a magnificent creature? Wohlforth’s book and the museum exhibits tell the other side of the story. 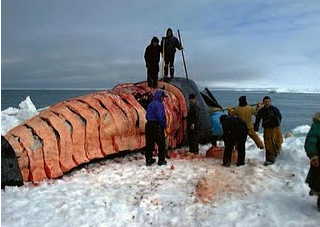 At least at one time, whale hunting was absolutely critical to sustaining life on the perimeters of the Arctic. It really isn’t anymore. Despite the remoteness of villages in Northern Alaska, all the conveniences of contemporary life are available. I appreciate the way that Wohlforth is unsparing in his depiction of the way the hunt is carried out these days. The whale is pursued in metal boats by some of the crews. Communication between crews is accomplished by radio. The whale is finally butchered with the help of chain saws. Innupiat Alaskans today can eat what the rest of us eat; they don’t need to kill whales to survive. I find it hard to be a four-square, true-blue, 100% animal rights advocate. I can’t completely dismiss the desire of the Innupiat to continue their traditional way of life. I can’t even dismiss the desire of the regular guy we met in Talkeetna to hunt and fish on the weekends. On the other hand, I can’t not see the tragedy of killing whales. And so I feel conflicted. If the whale hunt ceased, something valuable would be lost. As the whale hunt continues—and it does—something valuable is lost: the individual whales, and possibly (in the end) the species of bowhead whales. For there are only a couple of thousand left, and I don’t trust the Eskimo whale-counters who wish to reassure the International Whaling Commission that the bowhead isn’t in danger of extinction. Wohlforth argues that people who eat cows can’t, logically, be so deferential to whales. That argument has no force for me, since I don’t eat cows. But I wonder about the underlying thought, especially after watching whales myself. Are all animals to be lumped together, just because they are not human? Or could there be differences that make for moral differences? We think we are pretty special. No cannibalism allowed. But maybe whales are special too. Why? Is it the fact that they live for 200 years? (Somehow killing a being with a hundred years’ worth of experience seems especially bad.) Or is it their amazing ability to migrate from Alaska to Hawaii in the winter (but then salmon are amazing migrators too). Or is it the mystery of whale communication? Or is it really just an aesthetic magnificence to us that makes it a crime to destroy a whale—a crime on a par with destroying a painting or defacing a beautiful canyon? I don’t have the answers, but when all is said and done, I’m on the side of the whale. I have a fleeting fantasy of writing fiction one day. I’d like to tell the story of an Innupiat teenager who surfs the web and starts to read animal rights websites. Gradually, he stops being able to participate in the whale hunt. Conflict and alienation ensue and it looks like he’s going to lose his place in his community. But then, somehow, other people start to see his point. The community decides to end the hunt and find some other way to preserve the central place of the whale in their culture. With NSF funds they establish the Innupiat Center for the Study of Whales, which becomes a beacon for international whale research. Everyone lives happily ever after, including the whales. I’m conflicted enough to think even with such a harmonious ending, there would be something lost as well as something gained. It wouldn’t be exactly the same for the Innupiat. But I can’t bring myself to think that’s not the way things should go. That’s all for now…and by the way, if you’re an Innupiat teenager with an interest in animal rights, please do drop me a line! I would like to know if such a thing is possible, and what it’s really like.